Being an artist can be a lonely calling. Even if you aren’t an introvert by nature like many artists are, the reality of life as an artist is that you’re not often working around others. This idea that you have to do everything yourself, originally stemming from necessity, can become very ingrained and actually work to your disadvantage. As your business grows, you may reach a crossroads where the strategic choices you make will cause you to either grow or wither. Eventually the cost of doing everything yourself will outweigh the cost of paying an hourly wage to an employee, and you’ll need to hire a studio assistant in order to see your business grow and avoid burnout. So how do you make the leap from lone wolf to leader of a team? 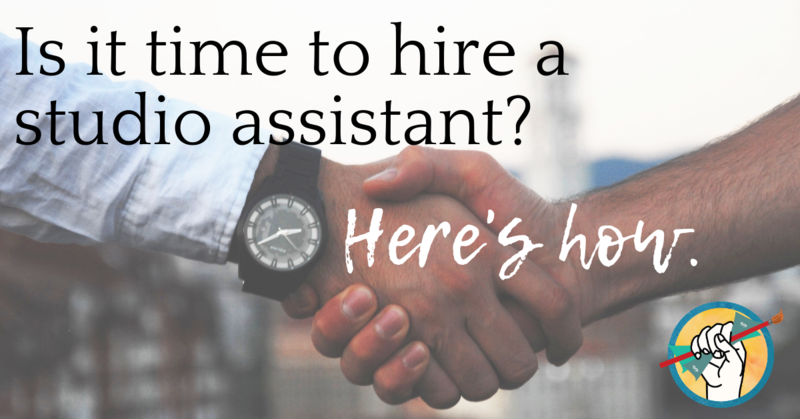 Let’s take a look at the signs that it may be time to hire a studio assistant (or other kind of help), and some key points you need to keep in mind to make a successful hire that will be good for your art business. 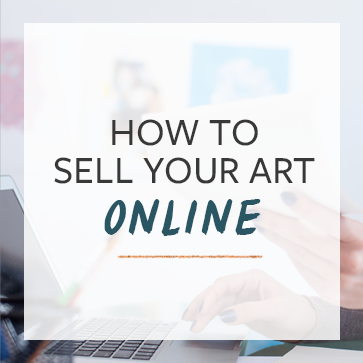 This is a huge one, and a problem we often see in professional artists in the Association who have been implementing the lessons they’ve learned in How to Sell Your Art Online for several years and are seeing success- but haven’t yet taken the leap to scale up their business with an employee. If you are working hard, finding that you’re raising your prices again and again but still very busy, it may be time to hire help. This really ties in with the previous sign. If you’ve set ambitious but realistic sales goals and you’re meeting them, that’s great! There’s a lot you’re doing right! But if your success is accompanied with a feeling of burnout, it’s likely that you need to: a) take a vacation, and b) consider hiring an assistant. Do you need an office manager to handle invoicing, supplies purchasing, and communications? Someone to clean and organize your space? A salesperson? Someone to prep and assemble parts of your work? All of these are different jobs with different skills required, so you need to have a clear picture of your expectations in mind before you begin the process of interviewing and hiring. It’s tempting to think you can just hire a studio assistant and expect them to do everything you don’t want to do. But the reality is that some of the things you need done are just as specialized as your art, and take specific training and personality traits. Take a look at the work you’re doing now: what is the most time consuming part of your job right now that doesn’t require the special skills you bring to the table as an artist? Hire someone else to do that job so you can give the time you need to actually making and marketing the art, and still find time for rest. Put the word out on your blog/social media/mailing list that you’re hiring, and ask your audience to share your job listing with anyone they know who might be a good fit. Be careful you’re hiring someone who wants to do that job, not just a younger artist who wants to learn from you on your dime. If you’re hiring someone just for communication, scheduling, and handling your digital marketing, you might consider sites like Upwork.com or PriorityVA.com (if you want a true professional). Know how much to pay them. Once you’ve determined exactly what you need from an employee, do some research on a site like Glassdoor to figure out the median wage in your area for that job description. STUDIO NAME is hiring a Studio Manager to handle project management, collector communication, and art material logistics. We are looking for an experienced project manager with the ability to shepherd multiple large-scale art projects from the concept stage through fabrication and installation, as well as following up with wholesale accounts to ensure restocking orders. Your primary job will be to protect the artists’ time and attention so they can focus on making more art. The ideal candidate is someone whose zone of genius is managing and organizing chaos into order. This is not a good fit for artists who are wanting a short stint somewhere to learn how to run an art business. STUDIO NAME, located in LOCATION, is the art studio for ARTIST NAME, TYPE OF ARTIST. This is a FULL TIME, PART TIME, CONTRACTOR or EMPLOYEE position based in LOCATION. Follow up, screen and evaluate inquiries for wholesale and custom artwork based on minimum criteria set by STUDIO NAME. Collaborate with artists to create project plan for large-scale custom art delivered to private and public collectors world-wide. These can include months-long projects with many moving parts. Once the project has been conceptualized and the collector has signed off, your job is to handle all communication regarding logistics and timelines, involving the artists only when changes to the art are necessary. Be an amazing partner who is fun to work with. This is a small team and we spend a lot of time together. Inventory and supply management with multiple vendors. If this sounds like a great fit, please submit a cover letter describing your interest in the position, as well as a resume. We will contact you for an interview, where you will be asked to demonstrate your communication and computing skills. When you apply for the job, please point out hte spelling mistake in this job description. Hiring your first employee is a huge step. Ultimately, if your business is ready for it, hiring an employee can mean the difference between abundance and burnout. You’ll do well to do plenty of research in advance, have a solid idea of what you are looking for in an employee, and spend some time chatting with other artists who have hired employees to learn from their experiences. Have you taken the plunge and hired an employee for your art business? We’d love to hear about your experiences in the comments!